Central Colorado’s must see outfit. 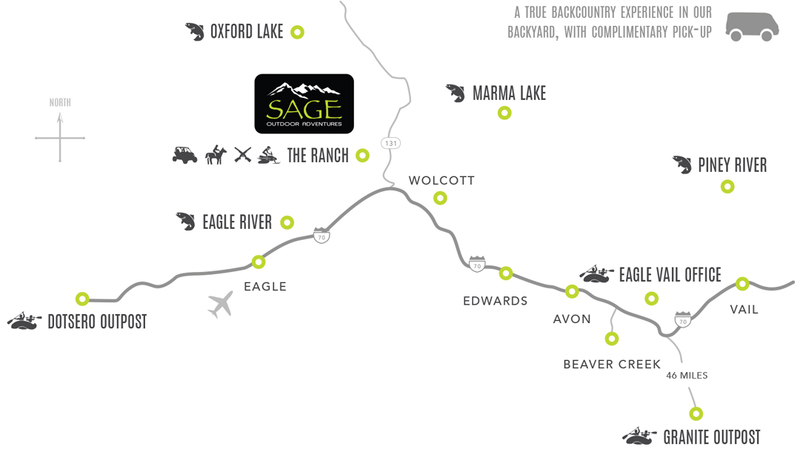 Land, Water, Motors, Horses, Fish, Paddle, Guns, Mild, Wild, Family Friendly, Exclusive Private, Budget A La Cart….you name it, Sage has got it. Let go. Allow yourself to be transformed through physical surroundings | Ride up till jaw drops. 7 mountain ranges and 2500 vertical feet off a canyon rim command the view | The guides are the magic. You're family here and we treat you accordingly. Generosity and genuine are the words | This trail system is the real deal. Made by riders, for riders. Don't miss this gem | From the reservation, to the arrival at the base lodge, to the guides and drivers, to the ride itself.... exceptional. Exceeded my expectations in all areas | Embark one person, come back another. The most powerful weapon on earth is the human soul on fire. We sell fun. We do fun. This is our lifestyle. If we didn’t like it, we wouldn’t offer it. We guarantee you’re going to make legendary memories with us! The amazing thing about rafting in the Vail area is the variety and quality of trips available, all thanks to mother nature. From steep riverbeds with big whitewater and hard paddling, to meandering scenic canyons with time to relax and soak it all in. The family of people that create your experience is what sets Sage apart. We truly love the mountains, and we enjoy sharing that love with our guests. We promise you won’t find a more fun, genuine, professional, and skilled group of guides anywhere else. We work hard to make your trip seamless and convenient. We pour our hearts into your experience so you can live in the moment, in the wild, right along side us. This year’s runoff is shaping up to be a memorable one! There’s a ton of snow in the high country and recent storms have continued adding to our snowpack. As we look forward to rafting season it’s only appropriate to begin by talking about one of our favorite early season trips, Gore Creek here in the Vail Valley. We’ve enjoyed fabulous winter snowmobiling here in the Vail Valley. But we’re also excited for spring. All this snow means incredible whitewater rafting ahead!